Make your own Brown Sugar Latte at home with this easy and delicious recipe! Don’t forget to add the extra caramel! I’ve teamed up with the American Dairy Association, Mideast once again to bring a “moo-velous” recipe to you all. Of course, all opinions are my own! Raise your hand if you’re looking forward to “back to school” time! My hands are lowered. To the floor. I’ve come to realize I am one of the rare people in this world who do not look forward to my kids going back to school. I love summer. I love the freedom to sleep in, go to the pool, or stay in jammies all day. I love the “NO HOMEWORK” life that summer has to offer. I love spending time with my kids all day (well, most days, some days I look forward to bedtime more than others). I hate the school supply shopping. I hate that I have to purchase those supplies weeks before summer ends. I hate that orientation and schedules come out WEEKS before school starts. It becomes this black cloud in my home. This hovering “doom” and gloom of school beginning. However, oddly, my kids love school and they look forward to going back every year. Apparently I’m the only one that gets sad and nostalgic about the end of summer and the start of a new school year. There is one highlight to school in session. Quiet mornings with a hot cup of coffee. Once I have sent my kiddos off to school, I love to sit outside with my favorite cup of joe. 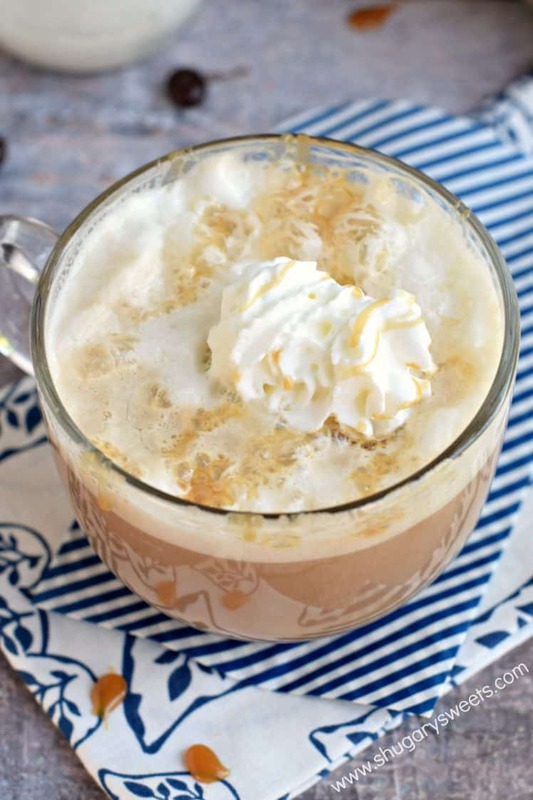 And this Brown Sugar Latte will be enjoyed day after day. which does a fantastic job (even faster) to make your milk frothy! Adding in the brown sugar when you heat the milk gives it a rich caramelized flavor too. I’ve once again partnered up with the ADA Mideast to bring awareness to a continued problem. Milk is the number one source of calcium, Vitamin D and potassium in children’s diets, yet 46 million Americans served by Feeding America only receive 1 gallon of milk per year. When you think about giving to a food pantry…most people obviously only give canned goods and other non perishables. The Great American Milk Drive is working to put milk in the fridges of families this back to school season. And YOU can help too! The American Dairy Association Mideast will donate $1 to the Great American Milk Drive for every “like,” comment or share each of the bloggers’ 10 recipes receive on its Facebook page between Aug. 10 and 26, which will be used to give gallons of milk to children and families across the country! So go head over there and do the easy part. Give our recipes some love, which in turn will help someone else in this country! See how many gallons have been donated to food banks in your state, and make donations directly, at www.MilkLife.com/give. Brew 2 cup strong coffee. In a mason jar, or glass pitcher, heat milk and brown sugar in microwave for one minute. If using the mason jar technique, screw lid on tight and shake jar vigorously for a minute or two until frothy. 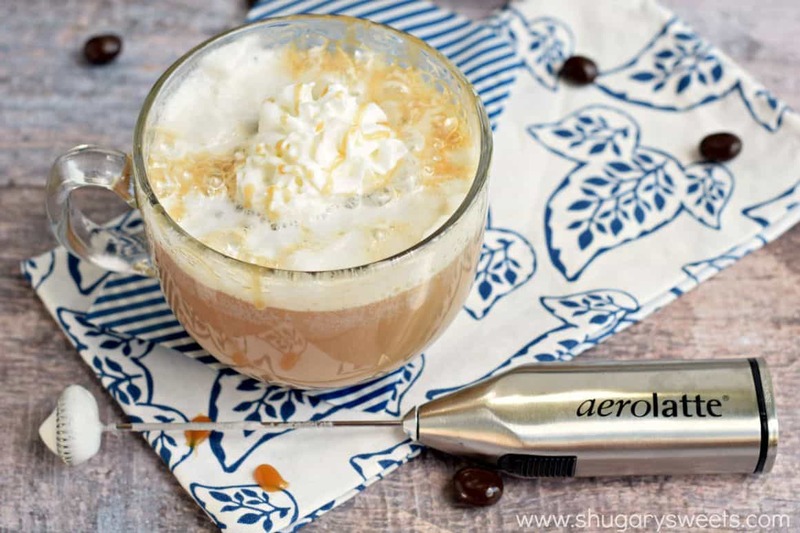 If using the aerolatte, follow directions to turn on and use, and froth for about 15-20 seconds. To serve: pour hot coffee in two mugs. Add 1 Tbsp caramel sauce to each cup and stir until dissolved. Slowly pour frothy milk over coffee. Add whipped cream and caramel sauce if desired (highly encouraged)!! **To cut the calories on this drink, use skim (fat free milk). You can also find sugar free caramel sauce and use a truvia (stevia) blend of brown sugar. ENJOY. 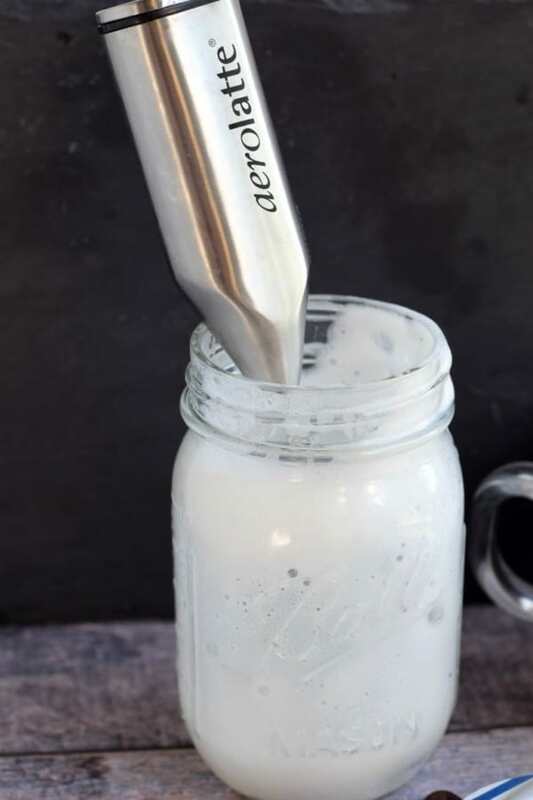 I’ve teamed up with some fellow bloggers to spread the Dairy love this month and encourage some good Back to School habits! Be sure you stop on over to their blogs and checkout their mouthwatering recipes! 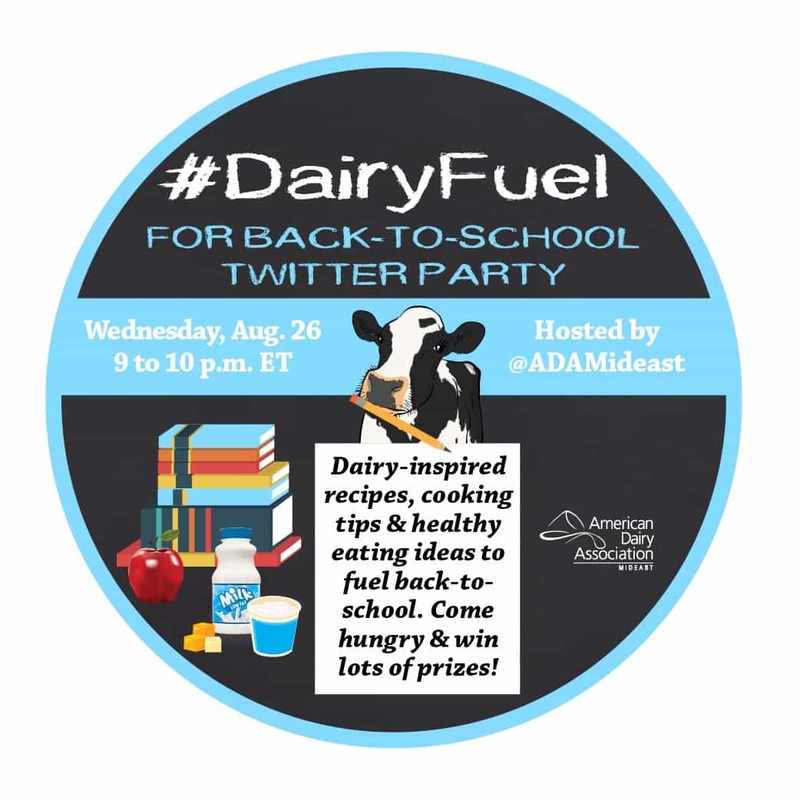 Join me (and all my blog friends) as we tweet with the American Dairy Association! Get some delicious back to school recipe ideas! Be sure to RSVP here! I’m in the mixed feelings camp here. On the one hand, I’m a teacher and I love my job. On the other, I love lazy mornings with my kids, and I don’t see them in the mornings during the school year. So it’s tough. But teaching is tons of fun! As is anything with brown sugar. I love using it this way! I LOVE my aerolatte, and I keep forgetting to break it out. I don’t have any kids to send back to school, so I can’t raise my hand on that. BUT, I can raise my hand on loving brown sugar and coffee…so this is happening, like, NOW. Pinned! I love lattes and this one looks delicious. I will have to look into purchasing at aerolatte. First kid going off to school this year! Back to school shopping was the worst. It was so hard to find all the specific stuff the teacher asked for. I need this Brown Sugar Latte to get me through. In fact, when done shopping at Target, I hit up the Starbucks at the front of the store. It was the only way. Next time, I (okay, maybe wife) can make me this! My kids have been looking forward to all of the above for weeks. The novelty of no routine gets old in our house I think. As much as I adore my children, I have my hand raised for coffee like this one in a quiet house for hours! 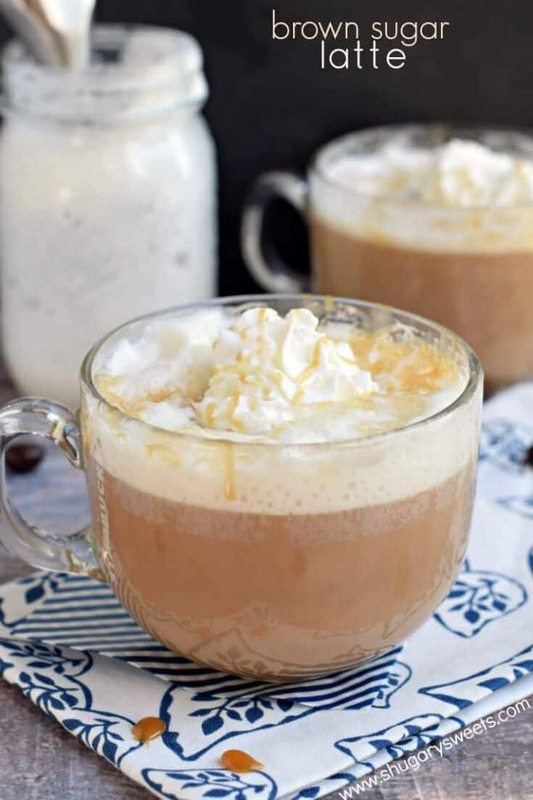 Love this fun latte! I’m with you!! I never look forward to my kids going back to school. Ugh! but I too also look forward to my quiet mornings after everyone leaves for school, cause there aint no quiet mornings happening around here in the summer! This Latte looks like a winner YUM! Awww kindergarten. Such a fun time!! Oh Aimee, I couldn’t agree more! I am the only one I ever know that wants summer to last forever. Our pool and summer camps help with that. HA. But, still. Summer is my absolute favorite. Thumbs down on back to school. Thumbs up on this latte, though. Delicious! Pinned. Yay, thanks for agreeing with me 🙂 And for pinning!! I’m a sucker for a good fluff with drizzle. Oh yum! Not having to worry about the grind of school…from the special event days to remember to bring this or that, the projects due, the homework, the rides here and there, etc. it’s so freeing during the summer! Totally agree! 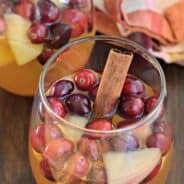 This looks like the perfect fall drink. Brown sugar and coffee and caramel, cannot go wrong! I will come down to visit and enjoy a cup of this with you on that first day back to school. I feel a tugging at my heart too. Just not quite ready to give up my time with my kids….wait….is that arguing I hear in the background? Ok, maybe it’s ALMOST time for them to go back!. haha, Of course today mine have been bickering ALL. DAY. LONG. I have a little aerolatte too but have yet to try it out! Now I have two excuses, this recipes and back to school! I’ve raised a bunch of lazy PJ loving kids, haha!! This looks so delicious! 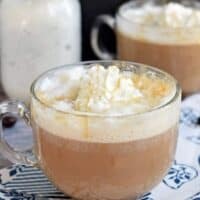 I can’t wait to try your mason jar technique – I have never heard of it before and it just may solve my daily latte cravings that I try so hard to resist! (Commented on their FB page!) What a great promotion/partnership with the American Dairy Association Mideast! I am so eager to make this latte! 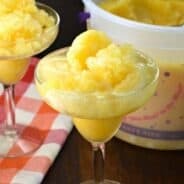 Sounds to die for (and easy to make)! A brown sugar latte sounds incredible! This is a must make for sure! This is most definitely how I would want to start my day!! I’m with you on the love of summer. I love the carefree days and know they will be gone before I know it. Boo hiss to back to school 🙂 At least sipping on one of these lattes would ease the pain. This latte looks so awesome… If I have to be at the office, I’d like to be at the office with this latte! This looks like the perfect way to start any morning Aimee! YUM! Hi Aimee, may I ask what type of caramel sauce are you using? Or, do you make your own? Thanks! What a nice recipes to make when a friend comes over for coffee! That’s it, Aimee, you need to open a coffee shop. I’d be there every morning to order this! Suddenly the cup of coffee on my desk looks all kinds of sad! This is so perfect! That sounds great. 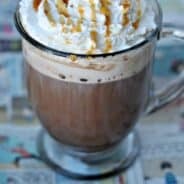 But since I left sugar out of my life, especially in coffee, could you suggest me another wonderful recipe?